The Outlandia project was finally launched on September 19th 2010 as part of The Great Glen Artists Airshow, an event organised by The Arts Catalyst in partnership with HICA (Highland Institute of Contemporary Art) and London Fieldworks. 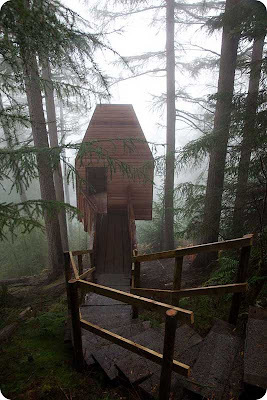 London Fieldworks worked with Edinburgh based Malcolm Fraser Architects to design a multi-purpose platform for the use of local and invited artists in Glen Nevis. 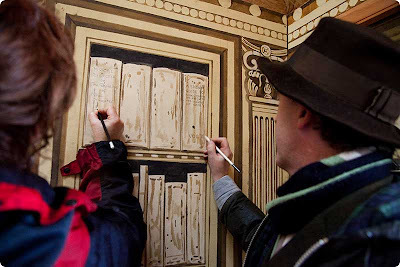 The original proposal was in response to an invitation from the Highland Council to create a lasting contemporary art legacy for the Year of Highland Culture. Click on images below to enlarge. 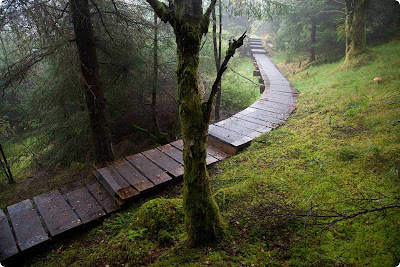 The studio was constructed by local builder Norman Clark and is accessible from the Peat Track to Fort William via a 1/4 mile larch boardwalk built by Dave John and his students from the Environmental Conservation group at Lochaber College. The Artist, Adam Dant was commissioned to make an aerial map (A Journey Through the Great Glen to the Library of Outlandia) charting the journey from The Highland Institute of Contemporary Arts (HICA) near Inverness, to Outlandia near Fort William. Complimentary to the map, the interior of Outlandia has been transformed by Dant into a place for the "categorisation of knowledge and observations" in the style of the Scottish Enlightenment, a trompe l'oeil library dubbed the "Bibliotheque Outlandia". Visitors to the library can inscribe their own titles onto the spines of the books.